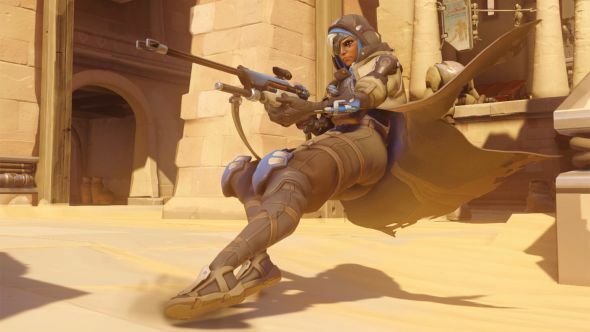 Overwatch healer Ana has become a fast favourite in the month (only a month!) since we’ve got to know her. Much of that is down to a very specific set of characteristics: the fact that she’s an Egyptian old lady in a medium not exactly stuffed with those; her fondness for firing health from a sniper rifle like some kind of goddamn red cross commando. Overwatch is one of the best PC games you could play right now. Weird, then, that she originally had none of that stuff. In fact, Ana might not even have been a she. Blizzard began with the knowledge that they needed another healer, since Lucio and Mercy were showing up in every game. That’s how they came to the Alchemist – a nebulous character whose on-the-fly pharmacy had them glug from a decanter and then jump really high, or provide an extra-long heal over time. “It was sort of interesting, but it had a lot of problems,” hero designer Geoff Goodman told VG247. Meanwhile, the team were struggling to place the personality of Ana, which they’d conceived independently. Her backstory positioned her as a crack sniper, but the game already had Widowmaker. Then inspiration struck – Ana could stand out and fill that waiting healer slot. Have you stuck with Ana beyond your initial new-hero experimentation?